We took another bus tour around the city this time following a different route and passed by the Neptune Fountain. Sculptor Juan Pascual de Mena began building this marble statue in 1780, under the orders of King Carlos III and in 1786 his disciple José Rodríguez finished off the project, which represents Neptune, God of the Sea, with a trident in one hand and a coiled snake in the other. The figure is standing on a chariot, drawn by two sea horses and surrounded by dolphins. 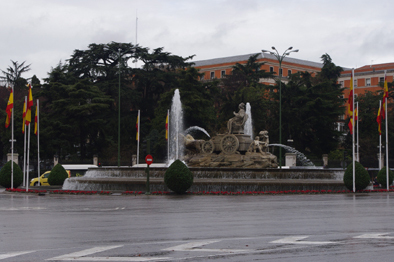 When the Atletico Madrid football team win a trophy the fountain becomes a focus of their celebrations. 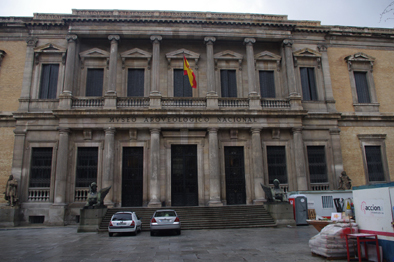 We stopped at the renowned archaeological museum, one of Madrid’s oldest museums, dating back to 1867. It shares the same building as the Biblioteca Nacional and Museo del Libro and traces the evolution of human cultures, from prehistoric times up to the 15th century. Unfortunately the museum was closed for renovations and we were unable to enter. 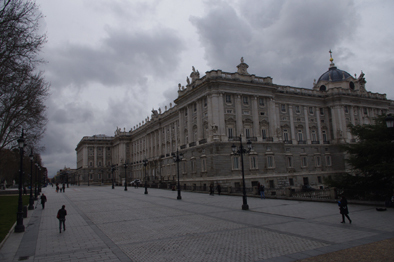 We passed the Palacio Real, or Royal Palace, which is Madrid’s largest building and possibly its most beautiful. It is the largest royal palace in Western Europe and was built on the site of the old Alcázar, the Moorish castle destroyed by fire in 1734. At the bottom of the road where our hotel was situated lies the fountain of Cybele, one of the city’s best known landmarks. It was designed by Ventra Rodriguez and depicts the goddess of nature riding a chariot drawn by a pair of prancing lions. The pair of water-spouting cherubs were added later. 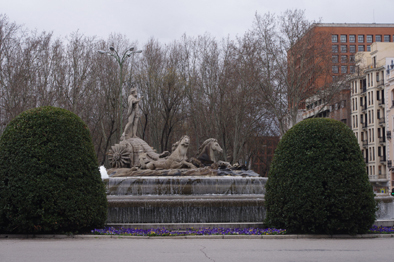 When the city’s other major football team and perhaps more famous team, Real Madrid, win a trophy, the fans head for this fountain to celebrate. Later that evening I watched Real Madrid beat Manchester United in Manchester on TV in the café attached to our hotel. It was a brilliant match and if I was a Real fan I would not have had far to go to celebrate. Tomorrow we have to pass by the Cybele monument to catch the airport bus for our flight home. It has been an enthralling holiday. Madrid is a city well worth visiting, the people are very friendly and we can return home having enjoyed a most wonderful trip.